CHATOM, Ala.---The Wilcox Gallery invites to public to an evening seminar on ‘Human Trafficking—it’s not just a big city problem” on Thursday, Feb 22 at 6:30 pm at the Wilcox Gallery, located at 273 Granade Avenue in Chatom. “Statistics show that only 1% of human trafficking victims are kidnapped. The majority are lured away by someone they have grown to trust. 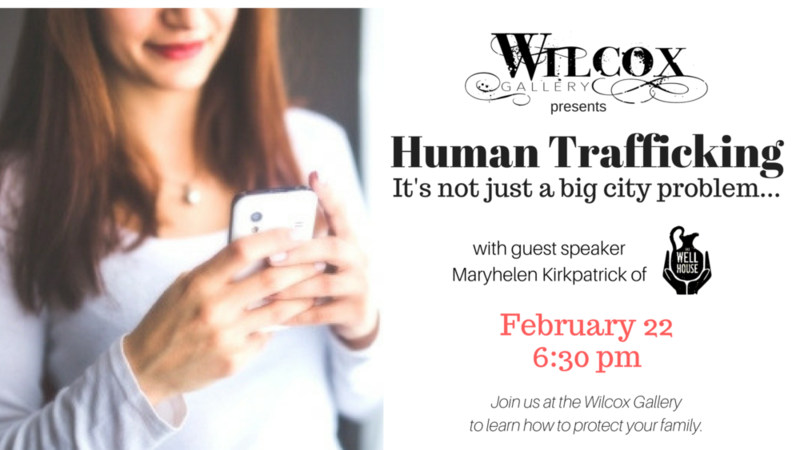 We hope parents and local professionals will join us at the Wilcox Gallery to learn more about the ways traffickers lure children, teens, and adults via social media and phone apps and identify ways to protect their loved ones,” said Alicia Atcheson, executive director of the Wilcox Gallery. Maryhelen Kirkpatrick of The WellHouse, a 24-hour shelter offering immediate housing for women being prostituted in the Southeast, will be the guest speaker for this event. According to Atcheson, Ms. Kirkpatrick will also teach attendees how to spot the warning signs of a victim and will share how The WellHouse is rescuing victims and helping them become survivors right here in Alabama. In honor of the End It Movement’s national Shine a Light on Slavery Day on Feb 22 and in addition to the public forum, the Wilcox Gallery is taking this message to each of the county’s five high schools, as well. Ms. Kirkpatrick will speak at assemblies in each of the schools on Feb 22-23. For more information on the event or The WellHouse, visit the Wilcox Foundation and Gallery or The WellHouse on Facebook. The WellHouse, located just outside the Birmingham area, is the only 24-hour shelter offering immediate housing assistance to women being prostituted in the Southeast. Learn more at www.the-wellhouse.org.